The stronger winds and big surfs that the Pacific Ocean is renowned for have finally arrived. The Clipper Race teams recorded some of their best speeds towards Seattle over the last day and night and are now preparing for their first taste of a North Pacific low-pressure system. The two leading teams from yesterday are pursuing very different tactics with PSP Logistics maintaining first position having stayed furthest north, whilst Unicef has dropped down the leaderboard having opted for the most southerly route of the teams, away from the rhumb line. IMAGE: Fleet positions at 0900 UTC. As the winds continue to build, the Skippers and crew are also preparing to batten down the hatches in expectation of the low-pressure system that is coming their way from Japan in a north easterly direction. 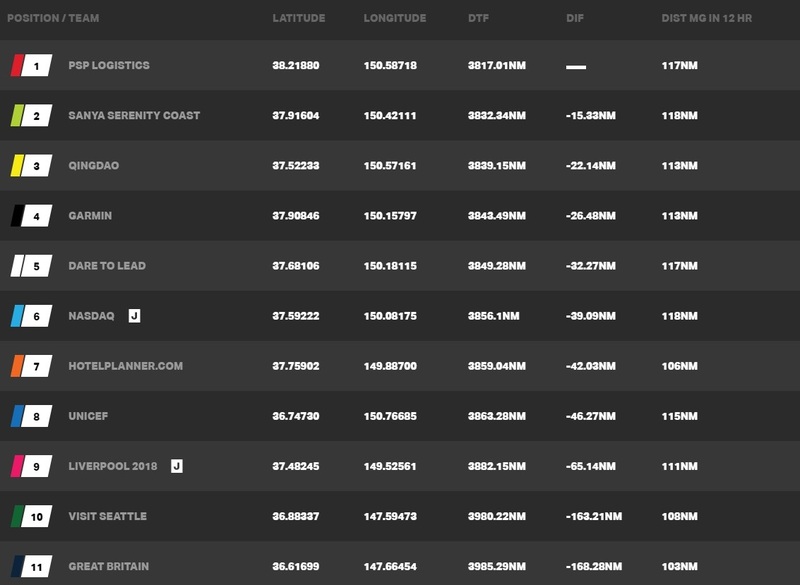 IMAGE: Leaderboard at 0900 UTC. The expected front should shake things up a bit today with winds gusting up to 50 knots with localised squalls bringing sudden increases and occasional large shifts. Keep track of the fleet to see how the weather systems affect the fleet via the Clipper Race Viewer and hear more from the Skippers and crew on the Team Pages.